Join us for our first ever OK2BME fundraiser! OK2BME is the only program of its kind in our region. We offer free counselling to LGBTQ2+ people aged 5-29 and their families. We also offer four different OK2BME social/recreational youth groups for ages 12-18, and public education and consultation on LGBTQ2+ issues. 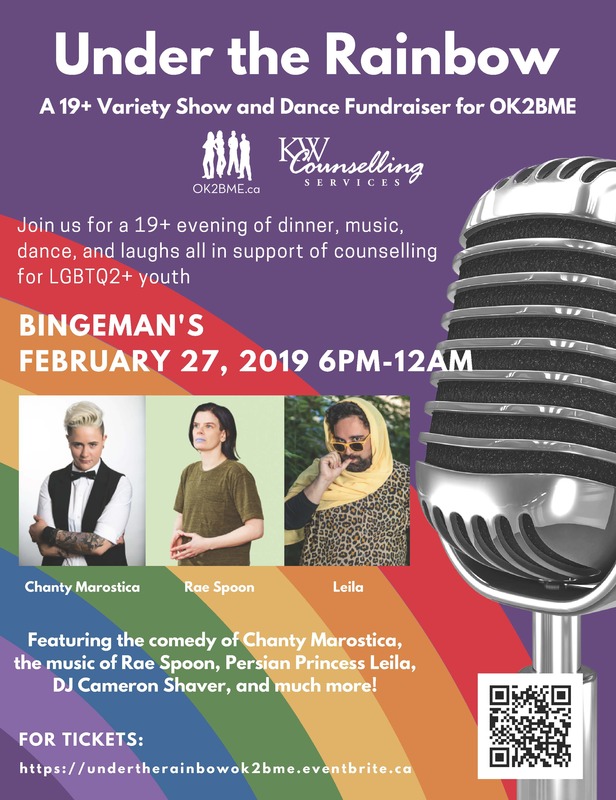 Join us at Bingeman’s on February 27, 2019 at 6pm for a unique variety show and dance featuring comedian Chanty Marostica, singer Rae Spoon, balloon artist Drew Ripley, Lovable Leila, and more! Your ticket includes a focaccia pizza and wings bar. Following the show, we’ll have a dance with DJ Cameron Shaver! Charlotte Zawada, REALTOR® – Re/max Twin City Realty Inc.